Audio Drama – the best Review! Our review of Heirloom Audio Productions In the Reign of Terror kept all three of us captivated during our long hours of summer travel. What a thrill to be transported back in time to the days of the French Revolution through this superb radio drama production. We experienced the truth of history through the life of Harry whose tenure with a Christian French Aristocratic family painted a firm picture of what living during the days of the Robespierre must have been like. The professional cast, strong soundtrack and effects combined with G.A. Henty’s authorship and Bill Heid’s production team at Heirloom Audio created a riveting story, making 2 1/2 hours of road travel pass in a blink. In The Reign of Terror is true history from a Christian perspective imbibed with the moral character traits of duty, bravery, and honesty. In the words of our five year-old, who listened intently to the entire drama, “I like Harry because he was such a hero and did what was right!” The audio story takes Harry from his English home to the French estate of the St. Caux family. With the onslaught of violence and overturn of the aristocracy, Harry commits his loyalty not only to this family but to truth and right. Anticipating the deliverance of the entire family, your heart is torn as you are pulled into the biased court for the execution sentence of several of the family. Yet, hope is renewed as Harry perseveres and through a providential brush with Robespierre is able to save the others. This is truly an adventure that is worth your listening time – time of which passes unnoticed as your imagination soars with each track. Heirloom Audio Productions understands the media-driven and addicted world that invades our lives daily, bringing along with it many times a mind-numbing experience of morally degrading stories, inaccurate facts, and poor influences. 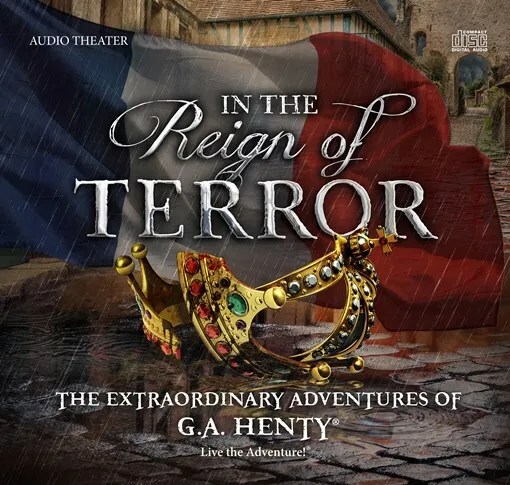 With a Christian foundation and dedication to the truth of history, audio dramas like In the Reign of Terror provide an opportunity for the listener to activate and expand his imagination. The real-life adventure of Harry offers thought-provoking circumstances not subtle innuendos and agendas. Going a step further, Heirloom Audio Productions makes available LiveTheAdventureClub.com which turns an audio story into an educational class with a downloadable or interactive study guide. In over 50 pages, listening questions, background history, related history, period recipes, activities, and geography assignments broaden the scope of the audio drama and reinforce key aspects to be learned. For those older students studying this era in history, what a great supplement to any curriculum! No doubt tech-savy student would enjoy the interactive quizzes and questions and teachers will appreciate all the easy to use enrichment material with the downloadable study guide. LiveTheAdventureClub.com is currently offering a 3 month trial in which you would have discounted access to many other Heirloom Audio Productions and their complimenting study guides and bonus content. The website also offers many other educational resources, kid activities and scores of other Old Time Radio dramas that the family will enjoy. You won’t be disappointed as you experience audio dramas like In The Reign of Terror!